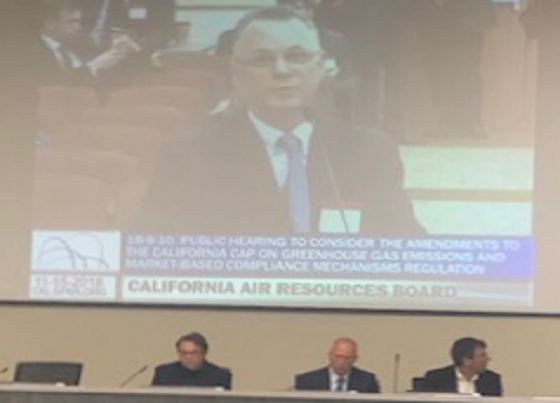 Sacramento, CA: Patrick Swarthout traveled to Sacramento on November 15th to testify before the Clean Air Resources Board on behalf of the GCVCC. The GCVCC’s Business Legislative Advocacy Committee opposed a recent proposal to implement a price ceiling that could harm our local economy by causing the cost of electricity, gas, and diesel to dramatically escalate. “My name is Patrick Swarthout and I represent the Greater Coachella Valley Chamber of Commerce representing over 1300 members in the Coachella Valley. I want to recognize Assemblymember Edwardo Garcia who represents the Coachella Valley for his leadership. Please consider our opposition to the proposed Price Ceiling that is a part of the Board’s proposal today. Our business community in the Coachella Valley like communities throughout California, depends on affordable energy in order to sustain jobs. As we all know the cost of doing business in California continue to escalate which make it harder for our business to grow and pay good wages. It’s important to promote an environment that supports small business owners and entrepreneurs, instead continuing to burden them. We already know that California consumers pay 49% more than the National average for their utility bills. Our members can not afford higher fuel and energy cost. We feel lawmakers intention is that your board needs to avoid adverse impacts on resident households and businesses and not create excessive costs that will hurt the state’s economy. Attached is a PDF with more information on this issue.